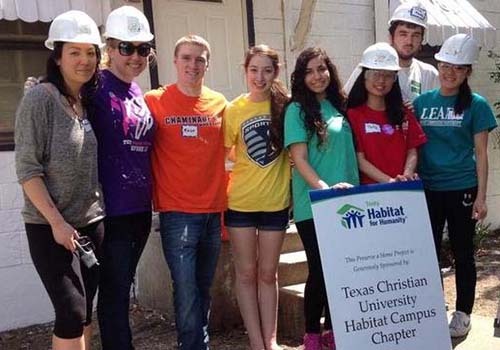 Students from the Texas Christian University Habitat Campus Chapter volunteered their time to repair and renovate existing housing for families in need and act as advocates for decent, affordable shelter during Act! Speak! Build! Week. 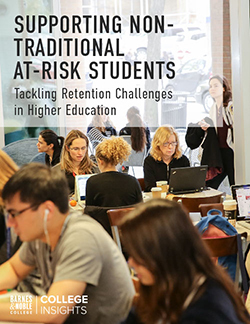 In its ongoing communications with customers, Barnes & Noble College employs a full arsenal of social resources and channels, much of it dictated by the nature of its customer base. 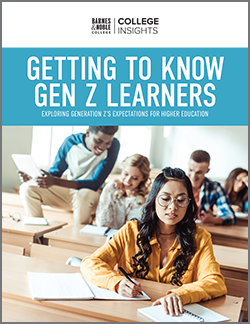 “Today’s millennial students live very much in the social realm,” says Barnes & Noble College’s Consumer & New Media Marketing Manager Tamara Vostok. “It’s where they live — it’s what they’re familiar with.” For that reason, social media has become much more than just another sales or public relations tool. It is a way to power a deeper customer connection. What is being shared on social platforms, and how it is being shared, is key to communicating with students. Content launched on social media platforms can take on a power of its own, as quickly shared and discussed, decoding that interest is vital for any brand wanting to maintain relevance in the digital age. With almost 800,000 Facebook fans, Barnes & Noble College’s social presence is rapidly growing as the company constantly fine-tunes its message across various platforms. A sweepstakes over Thanksgiving delivered 13,000 new fans in one day, while a “WINter Wonderland” promotion added 15,000 additional fans. Recently, Barnes & Noble College participated in Act! Speak! Build! Week with a social program launched to support partner Habitat for Humanity International. The program focuses on educating others about the importance of Habitat for Humanity’s mission – letting people know it’s not just about raising a hammer, but about raising awareness and raising funds. 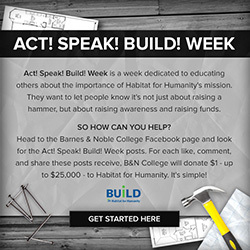 For every like, comment and share posted to the company Facebook page, Barnes & Noble College provided a $1 donation to Habitat, with a program target of $25,000, in a social initiative that both promoted substantial fundraising and encouraged social activism.